But Prometheus was not unique in its attempt to explain or elaborate on the nature, origin or motivation of the Space Jockeys, having in fact been long beaten to the punch by the comic books. 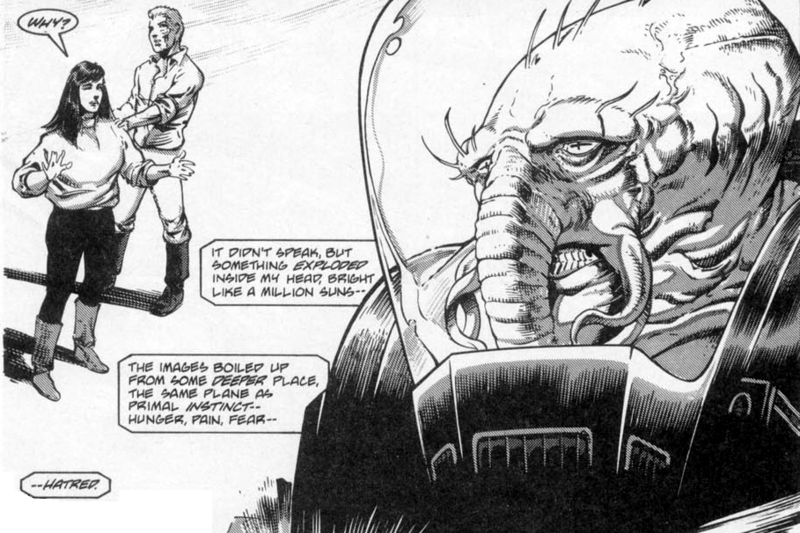 While the film envisioned the Space Jockey as nothing more than a protective shell for a more human, arguably less frightening being known as an Engineer, the comics kept the Jockey unrelated to humanity but still largely involved with its destiny, intentionally or otherwise. And while the Engineer concept was an interesting design experiment that combined Classical ideas of the heroic figure, Renaissance-era ideas about Heavenly and Hellish beings, and Giger’s signature biomechanics, the comic books depicted a sometimes familiar elephantine creature albeit in unfamiliar contexts: most notably, out of his famous cockpit and walking amongst us, either physically or through psychic means. 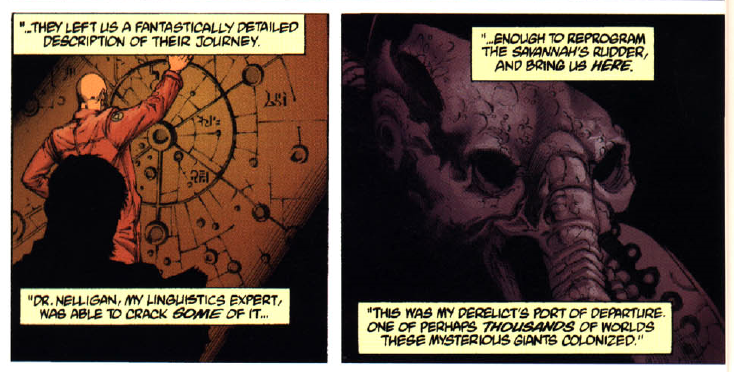 The Space Jockey of the comics and the Engineer of Prometheus turn out, on the whole, to share very similar characteristics and motivations, despite being drastically different in terms of actual design. To be very simplistic and brief: the Engineers are bioweapon developers, have an implied (but undefined) relationship with the Alien, and harbour inexplicable designs for humanity and Earth. In the comic books, the Space Jockeys have a strongly implied history with the Aliens stretching back millennia, and one Space Jockey in particular also has designs for the Earth and humanity. These similarities are not coincidental, but that’s also not to say that Prometheus borrowed anything from the comics books preceding it. In fact, both the comics and the film owe their dues not to Alien itself, from which almost nothing about the Jockey can be ascertained, but from comments made by Ridley Scott after the release of the film. If the Alien were a bioweapon, and the Space Jockeys were transporting them, then it’s fairly obvious to reach the conclusion that the Jockey race is, if not malevolent, then certainly dubious in its intentions. An oft-repeated piece of Alien lore is that during production the film’s crew felt that the Space Jockey was somehow a benign creature. This I would probably put down to Dan O’Bannon’s influence; in his script, which many had read, the Jockey was an unfortunate explorer who is exposed to the Alien, much like the film’s protagonists. Ridley’s conception of the Jockey as a military pilot likely sprouted and bloomed when production realities forced him to merge the derelict ship and the egg silo into one location, whereas in the original script and many of the initial rewrites these were two distinct and separate areas. Two sets of the comics in particular elaborated on these broad strokes of the Space Jockeys motivations and behaviour. The first was the initial run of Dark Horse’s Aliens comics (which form a trilogy: Book One, Book Two, and Earth War) which were written by Mark Verheiden and ran from 1988 to 1990. 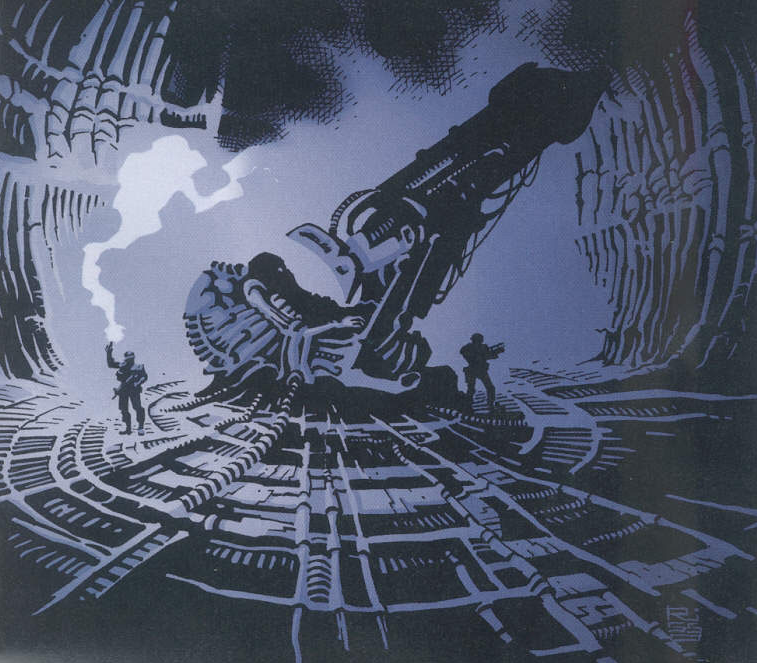 Another notable comic entry which bears notable similarities to Prometheus, and which we will touch on after Verheiden’s work, is 1999’s Aliens Apocalypse: the Destroying Angels. Book One (May 1988 – July 1989) takes place several years after the second movie, with Ripley AWOL, Newt in psychiatric care, and Hicks back in the military following a spell in quarantine. The overall story concerns Earthly interest in obtaining an Alien as a bio-weapon. Hicks is recruited to train a squad of Marines to travel to the Alien homeworld, though this is really a ruse to obtain samples for weapons development. Learning that Newt is due to be lobotomised, Hicks snatches her from the psychiatric hospital and takes her along on his mission. Once they arrive at the Alien homeworld, the team is quickly decimated. Verheiden hints at an ancient antagonism between the Alien and Space Jockey species which has had negligible effects on countless civilisations throughout the universe: this time, it is humanity who is caught in the crossfire. 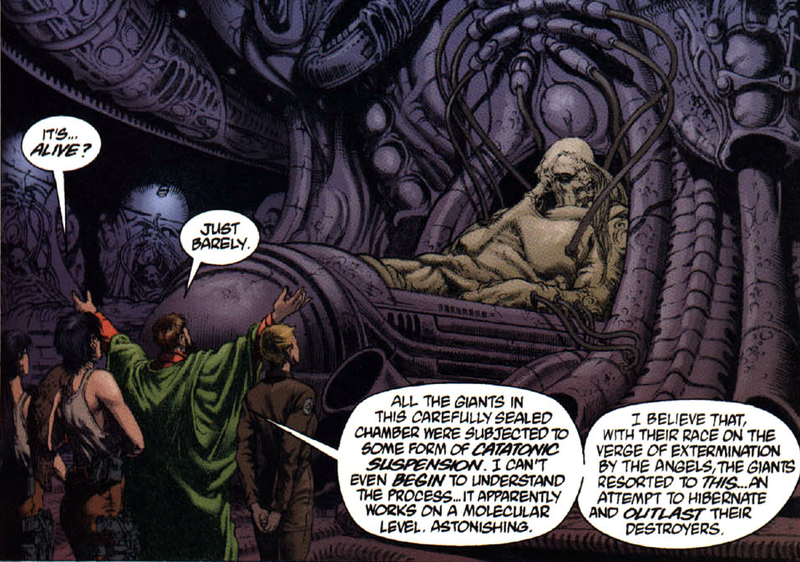 The association between the Alien and Space Jockey in the comics is usually portrayed as one of attempted master and slave, a relationship often paralleled by humanity’s attempts to domesticate the Alien, and that concept seems to have its origin here. At the end of Book One the Earth is overrun by Aliens and is steadily abandoned by humanity. As Newt watches the emptying globe from her ship the Pilot she encountered back on the Alien homeworld re-establishes a psychic link, allowing her more insight into its motivations: it had followed Newt and co. back to Earth, knowing that the planet was endangered. With humanity gone, the Pilot would assume mastery over the planet, and should humanity ever return, they will find it waiting. No Space Jockey or Pilot appears in Book Two (March 1990 – May 1990), which focuses on the battle between Man and Alien on Earth. Earth War (July 1990 – October 1990) the third and final part of Verheiden’s opus, deals with Ripley and Newt’s quest to seek and destroy the ‘Alien Mother Queen’, who haunts their dreams through psychic interference. With that done, they discover that in their absence the Pilot has subjected Earth to terraforming, which will one day render it uninhabitable for humans. Newt also learns that the Pilot is not only the architect of this new Earth but is also responsible for directing them into their encounter with the Alien Mother Queen – for his own selfish reasons, of course. The Pilot has no dialogue throughout the series, but Newt describes him in some chilling soliloquies after being given access to his mind. The Pilot is powerful yet restrained, ancient yet savage. He is an opportunistic planet-snatcher, a powerful psychic and manipulator. That was the end of Verheiden’s trilogy, so to speak, and the end of his story. 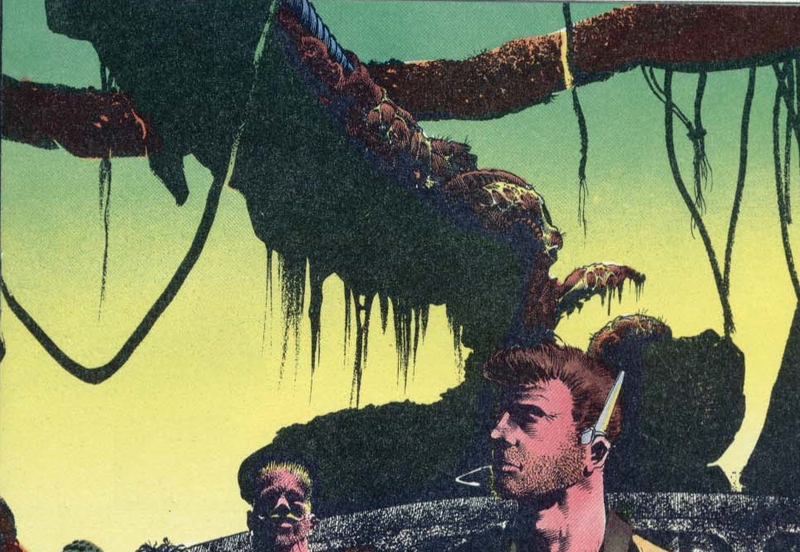 Dark Horse were to move on with a new series, and in November 1991 they published a story written by John Arcudi, simply titled The Alien, which served as an epilogue to the Book One–Two–Earth War triptych, and also as a prologue to the then-upcoming Aliens: Genocide, the sequel to Verheiden’s trilogy. The one-off is notable because it resolves the Pilot subplot and also sets the stage for the re-inhabitation of Earth for the new series. The Alien takes place some time after the conclusion of Earth War and sees the remaining vestiges of humanity’s military and government bodies returning to Gateway Station in Earth’s orbit. Once there they find that the Pilot is slowly terraforming the planet. The President of the United States is briefed on the Pilot’s intentions, and a plan is formulated to assassinate him so humanity can reclaim the Earth. The President boards the Pilot’s ship with a contingent of undercover androids, ostensibly to enter “face-to-face negotiations for the re-population of the Earth.” The Pilot, however, attacks the group and mangles the androids. The President, before he can be killed, ingests a hidden fluid (a cyanide capsule substitute) that stimulates an Alien embryo growing within him – the subsequent chestburster erupts from the President’s chest and lunges for the Pilot. One of the maimed androids initiates a nuclear strike on the ship, and the strip ends with its destruction, allowing humanity to return home. But the similarities between Prometheus and Aliens Apocalypse: The Destroying Angels seem less circumstantial, though, of course, they very well may be. The comic, written by Mark Schultz, revolves around a rescue organisation, Throop Rescue and Recovery, who are hired by a scientific organisation called the Geholgod Institute to track down one of their founding members, Dr. Lucien Keitel. Some years before the events of the story Keitel discovered a derelict ship in a distant star system. The Institute stripped many advanced technologies from this derelict via information sent back by Keitel, but one day all communications cease, and the derelict, along with Keitel and his crew, disappear in deep space. A small, possibly inconsequential note, but as a student of Medieval literature and Old English texts, the name of the Geholgod Institute really struck me, as the word ‘geholgod’ closely resembles the Old English ‘gehalgod’, which roughly translates to ‘hallowed’ in modern English. Think, the Lord’s Prayer (or the Iron Maiden song): “si þin nama gehalgod”. You could infer that there is some relevance or connection between a phrase from the Lord’s Prayer and an institute whose members are entangled with alien beings they refer to as angels, not to mention the eschatological tones throughout The Destroying Angels… but I’m not aware of writer Mark Schultz’s thought processes in this instance. It was interesting enough to note down, however. The Throop R&R eventually find Keitel on a distant planet, where he has sequestered himself underground in an ancient city built by the Space Jockey race. An Alien infestation has already broken out in the underground city, with Keitel’s men having offered themselves as hosts. Keitel still lives, and takes Throop under his protection and explains to them his motivations and the greater history between the Aliens and Space Jockeys. It is revealed that Keitel’s incentive for his original expedition had its origin in a paleontological dig in Australia that unearthed evidence of lifeforms that predated the oldest previously known formations by a billion years – these mysterious lifeforms had been exterminated in one swoop 3.2 billion years ago, and Keitel resolved to find out why. He explains that further archaeological work throughout the galaxies and alien redoubts had uncovered ancient messages left by the Space Jockeys – co-ordinates for distant civilisations and pathways and waypoints that were now all abandoned or dead. His conclusion that the Aliens are a divinely co-ordinated wave of annihilation stem from these discoveries. The apocalypse had happened before, he affirms, and it would come again. Keitel then charges Throop with returning to Earth with his research so that humanity can be convinced the apocalypse is imminent. At the end of Jon Spaihts’ Aliens: Engineers script Watts (who would become Shaw under Lindelof’s pen) must contend with a Space Jockey Alien, as do the characters in Aliens Apocalypse. There are some obvious parallels to Prometheus already that shouldn’t need pointed out. Though the circumstances are not duplicates of one another per se, they utilise the same setpieces or tropes in a largely familiar manner. Another similarity concerns the android characters in both works. In Jon Spaihts’ Alien: Engineers script and Aliens Apocalypse the android characters, David and Baal respectively, allow their fellow crewmembers to be exposed to Alien spore. 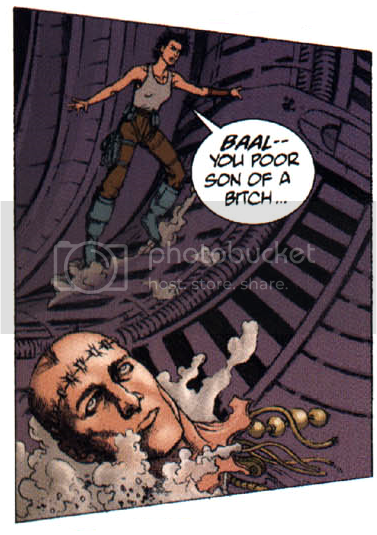 Baal’s greatest act of malfeasance comes when he places an Alien egg before the lone Space Jockey and allows it to become infected with the Alien larva. David employs the same sort of subterfuge, and at one point in the script he directly infects Watts with an Alien. Both are also decapitated in the Jockey chamber (check both David and Baal). 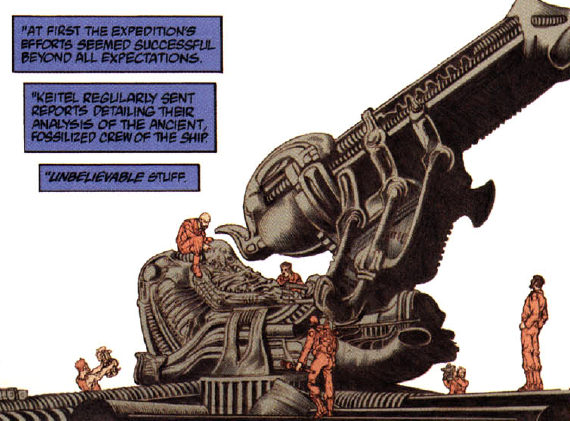 For this endnote I thought it would be beneficial and of interest to show how the various comics actually depicted the Space Jockey, dead or alive. There is a rough chronological order at work, though this list is by no means complete – there may be many more Jockeys drawn out there that I have not seen. The first appearance of the Jockey in the comics is, of course, Metal Hurlant’s 1979 adaptation Alien: the Illustrated Story. Though this comic features some scenes from the first movie that weren’t filmed (see: Dallas confronting Ash) and what might be some embellishments or misinterpretations (see: the box Alien) it didn’t take any liberties with the Jockey itself, which appears in one lone panel and serves the same aesthetic treat function as it does in the movie. 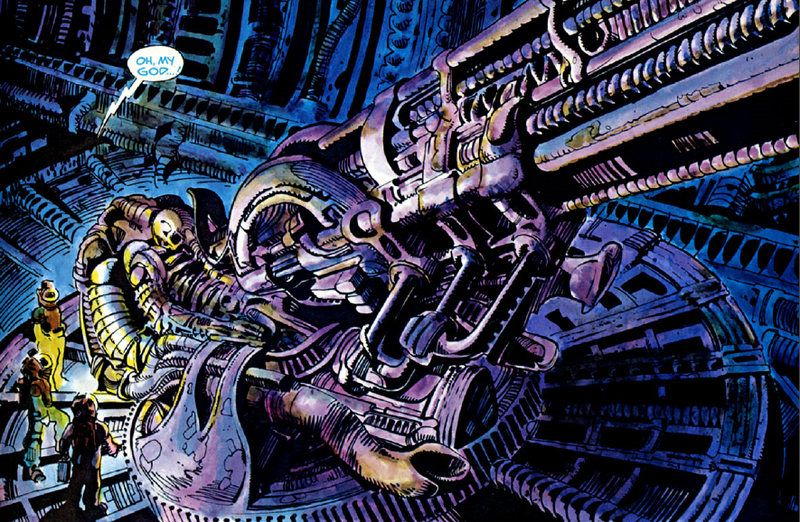 The design is faithful to Giger’s paintings and prop, as most of the dead Jockeys are throughout the various comics – obviously, there is little room for variation when depicting such a fixed, uniquely shaped creature. The LV-426 Jockey does not appear in the Aliens adaptation Newt’s Tale (which is true to the film, despite the comic wielding significant artistic licience with its presentation of the outbreak at Hadley’s Hope) but it appears in a flashback in Book One. 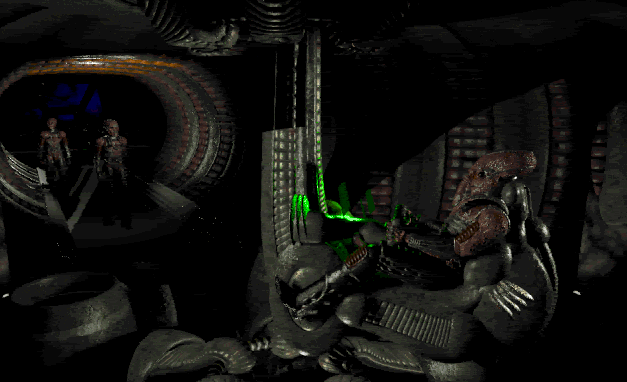 Above is the first Jockey to have clambered out of his cockpit – designwise, this creature resembles Watto more than it does the Space Jockey, and the spacesuit and bubble (not to mention his boots) come across as silly details, and completely unlike the ethereal carcass dreamed up and committed to film and canvas by Giger. 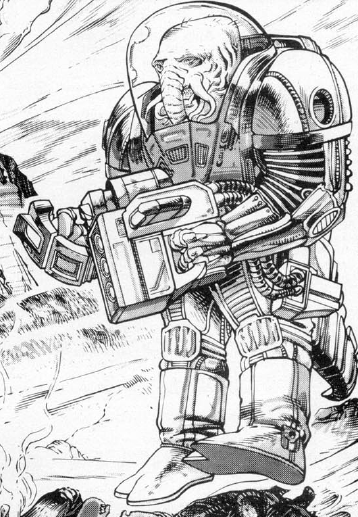 But to be fair, living up to Giger might have been an impossible task – celebrated artists and designers like Ron Cobb, Moebius, and Chris Foss all tried their hand at designing the Space Jockey, and none were as strange and unique as what Giger eventually came up with. An expeditionary team lands on LV-426 to investigate the fate of the derelict after the conclusion of Aliens and find that it has been buckled rather than destroyed by the explosion at Hadley’s Hope. The ceilings have caved in and in one panel (above) the Jockey himself lies exposed, draped by wiring and dripping with moss. 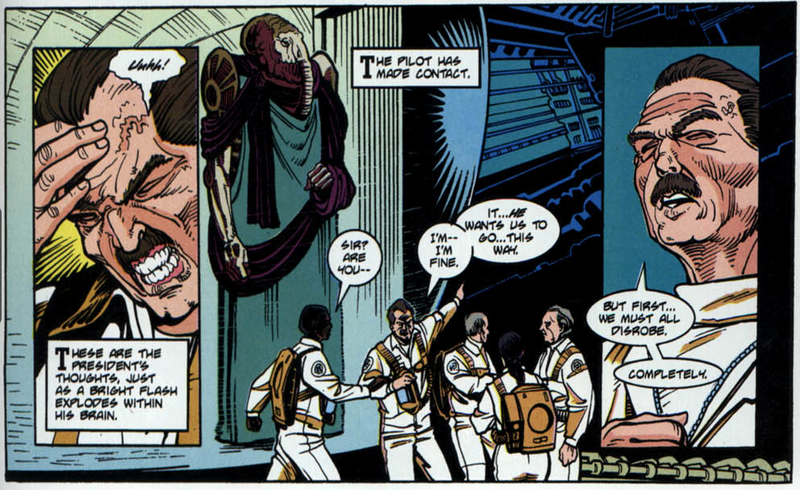 This is ostensibly the Pilot from Verheiden’s stories, who has ‘conquered’ the Earth so to speak, and he has ditched the spacesuit from his first appearance and donned more imperial robes. He no longer resembles Watto, instead appearing dessicated and wrinkled. It’s remarked that his eyes are cold and dead. This Space Jockey, who made intermittent appearances throughout the Dark Horse series and played a sinister background role, is finally dispatched by a suicidal President of the United States and a nuclear barrage, clearing the way for some return to normality. When it comes to portraying the dead Space Jockey and figuring it into a story it’s usually more of the same: either we see it through a one-panel flashback, or an expeditionary team seek or stumble across a derelict (often the derelict), inspect the Jockey corpse therein for a panel or two, and then become entangled with some Aliens. These seem like they are meant to be tantalising little appearances but they are in fact the least satisfying of the Jockey’s comic book appearances. The Jockey in these instances is still a prop, a dogwhistle meant to invoke the first film’s mysteries. It seems that more than one Jockey ship is having containment issues with its cargo… in fact, entire planetfuls are having trouble. There is a wealth of Space Jockeys in here, the majority of them long dead. The first to appear is the Jockey Dr. Keitel finds in deep space. Design-wise, it’s no different from the LV-426 Jockey. The rest of the dead Jockeys that appear -bar one- are likewise long dead and their designs are no different from the one above. Again, set dressing. Would you like to see Strange Shapes cover other elements of the comic books? Perhaps a look at the various Alien hybrids (Space Jockey Alien, King Alien… crocodile Alien)? Let me know! Great read as always. I passionately feel that the story Aliens Labyrinth could really do with a revisit and analysis. 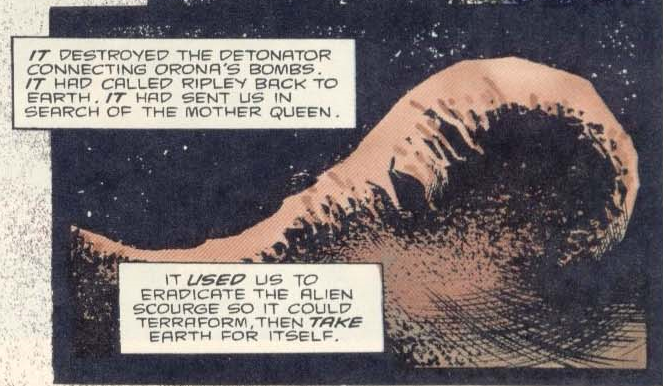 To my mind it is one of the most frightening and disturbing tales in the Aliens comics cannon. Woodring and Plunkett truly cooked up a visceral and grotesque story that I felt really dug deep into the terror of an alien hive and the sheer hopeless abandonment of anyone unlucky to be captured by one. If only there had been a spin off film or ideas borrowed from the story…if only. I have Labyrinth here, so it’s entirely possible to do an overview or exploration of it. It might be a good idea to see how the many comic book hives (and the social structures within them) are depicted. There are enough different iterations to make for an interesting analysis. Speaking of Labyrinth and Jockeys – Aliens : A Comic Book Adventure features both as far as I know. Never was able to play it, or had enough time to watch a Youtube walkthrough, so I don’t know the story properly or its wider context, but from the bits I’ve seen, both Church and Jockeys (living ones) are in it. Never though the original Labyrinth comic lived up to its potential. Fell apart towards the end. 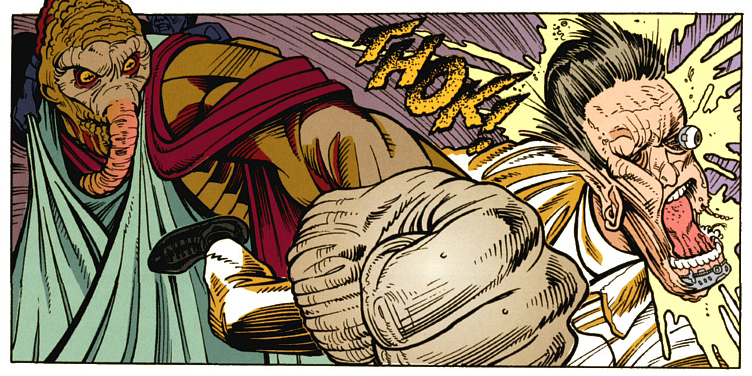 The Aliens: Comic Book Adventure is a neat little thing. I never did watch all of the footage fro CBA. How far into the game was this? I’ve always found the comics to be a fascinating, yet cheesy addition to the Alien universe. This probably stems from their inherent ability to render the dark, and scary environments of the films. Regardless, I’ve found many of the stories to be truly horrific and thought provoking. I would love to see more discussion and dissection of some of the story lines. I own several of the Omnibus collections and after reading this article, I think I’m going to go back and read them again. The comics, I think, are largely hit and miss. They are responsible for a lot of myths about the films (for example, as I mentioned in another article, the ‘warrior’-‘drone’ issue.) There are wads of comics you could throw out and never miss. I’m fully favorable on articles about the comic book lore and the various types of Xenomorphes. I love the comics. They kept the series going through increasingly bad movie ideas and had some genuinely cool ideas (Aliens: Genocide remains one of my favorite comics ever) over the years. I second an article on Aliens Labyrinth. A fantastic book that I loved since I was twelve. It also brings up the idea of what happens to a hive if it lacks a queen and the ability to create a queen. Finally, a new post! Great reading, once again. Thanks man! I fully agree with Valaqueen, the comics are straight hit or miss. But they were always interesting. I fully endorse more reviews of the comic book universe. Great article. I haven’t read many Alien comics, unless you count the AvP comics. It’s a shame those films are bad, because several of the comics are rather good. On an unrelated note, have you seen the newish book “Alien the Archive: The Ultimate Guide to the Classic Movies”? Got it for Christmas and it’s fantastic. Talks about a lot of things I first learned through your writing, but also has lots of neat photos and production art from the four Alien movies you might find interesting.